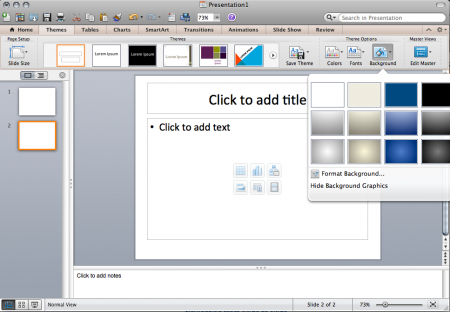 Microsoft PowerPoint is a popular program for creating electronic presentations in the form of slide shows. This ITS training document deals with PowerPoint 2011, which is the latest version of PowerPoint for the Mac. Note: the terms “presentation” and “slide show” are synonymous and will be used interchangeably throughout this document. The ribbon can help you quickly find the commands that you have to have to complete a task. Commands are organized in logical groups that are collected together under tabs.The tabbed command bar is at the top of a window. The ribbon is a supplement to the traditional menu bar. It combines the Formatting Palette and Elements Gallery from previous versions of Office, and gives you quick and convenient access to the features and tools that you use the most. Commands are organized into the tabs (such as Home tab, Theme tab) and are included in the ribbon for formatting, inserting elements, charts and layouts. In Microsoft PowerPoint 2011 the ribbon is located directly below the standard toolbar and is organized into nine different tabs with scrolling galleries that consist of different commands. The nine scrolling galleries each have their content divided into the sections. While using the tabs, only one tab can be active at a time. 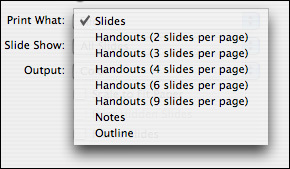 The left most tab in all PowerPoint documents. It contains the features and commands that you will probably use the most. Each tab is arranged into logical and related groups. For example, Slides, Font, Paragraph, Insert, Format and Slide Show. Under Themes, click the right arrow scroll through styles right button to scroll through the themes. To expand the list to see all the themes, point to a theme, and then click more down arrow. To browse for more themes, at the bottom of the expanded list, click Browse Themes. Allows you to create tables with different options, styles and drawing borders, etc. PowerPoint provides many handy methods for inserting tables into your documents. For example, you can quickly insert a basic table or draw a table cell-by-cell to form rows and columns. On the Tables tab, under Table options, click New, then click and drag across as many rows and columns as you want. You also can draw a table by using Draw Borders Command. To Add a table that contains built-in styles (If you applied a theme to your presentation, the table styles available for you to choose from coordinate with the theme and theme colors). On the Tables tab, under Table Styles, click the style for the table you want to add. A dialog box will appear and in the dialog box, select the number of columns and rows that you want. On the Charts tab, under Insert Chart, click on chart type, then click the one that you want to add. When you insert a chart into PowerPoint, an Excel sheet opens that contains a table of sample data. You can replace the sample data with the data that you want to plot in the chart and as you enter the data into the table you will get your chart on PowerPoint document. Allows you to create graphics very easily, such as the life cycle of plant, using the templates provided. This new feature allows you to make that average PowerPoint document into a flashy graphic and text loaded document. You can create an organizational chart by using a SmartArt graphic to show the reporting relationships in your organization. On the SmartArt tab, under Insert SmartArt Graphic, click Hierarchy, then click Organization Chart which is the first SmartArt graphic. You can use different layouts to do your graphic models. Make moving between slides more visually interesting. You can easily apply the same transition to all slides, including the effects and options you have selected for that transition. On the Transitions tab, under Transition to This Slide, click the transition that you want, for example Fade. To see more transitions, point to a transition, you can click . To vary the transition, such as the direction it moves on the screen, click Effect Options, then select the variation you want. Or, you can change other options such as duration, sound or advancing the slide. Under Apply To command box, click All Slides to apply your transition to all the slides. You can animate the text and objects or a single element of your document. An object can be a text box, an imported graphic, a shape, a picture and so on. This can give visual effects including entrances, exits, changes in size or color and even movement. You can use any animation effect by itself or combine multiple effects together. On the Animations tab, under Entrance Effects, Emphasis Effects, Exit Effects, click the animation that you want. If you want to deliver your presentation, you can play your slide show in full screen view. To play your slide show from the first slide click on Home tab, under Slide Show, click the arrow next to Play, then click Play from Start. To play your slide show from the currently selected slide, select the slide that you want to start the slide show from. On the Home tab, under Slide Show, click Play. To end the slide show when you finish presenting, press ESC. Allows you to track changes made, comments and share the PowerPoint document. Using the Review tab you can comment on the documents, compare and protect your documents. The Toolbox contains Custom Animation, Reference Tools, Scrapbook and the Compatibility Report in PowerPoint documents. Toolbox has some specific tools. 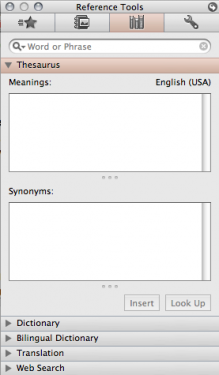 For example, the PowerPoint Toolbox contains Custom Animation, reference tools which provide access to thesaurus, dictionary and translation information. To change the display settings of the tool bar you can click on Toolbox Settings and make the changes you want. 1. First, open Microsoft PowerPoint by clicking Macintosh HD > Applications >Microsoft Office 2011 > Microsoft PowerPoint. 2. You will see many templates in “PowerPoint Presentation Gallery”. You can pick a document with a template or theme that you want and a blank document will appear to that template or theme. You can quickly insert text or other items in a blank area of a document. 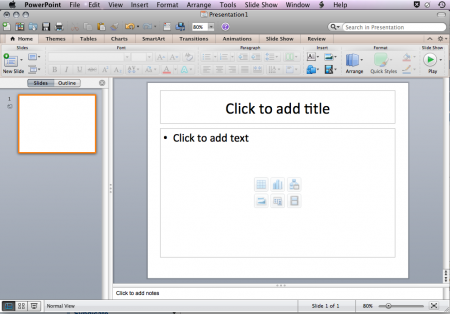 PowerPoint documents will automatically display the formatting tool that are necessary in creating a document. 3. Your slide show starts off with one slide, and its layout is initially a simple title and subtitle. If you want, you can change the layout of your slide. 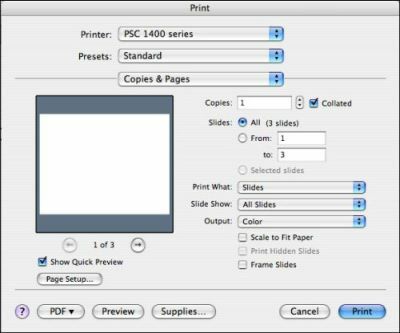 PowerPoint has a number of predefined layouts that you can use. In the Home tab (more information on this new feature below) you’ll notice there is a Layout button in the Home tab. Click the Layout button and you will see the different predefined layouts that you can use. Click the New Slide button which is located in the Home tab. In the middle of the slide you will see elements you can add such as a Table, Chart, SmartArt Graphic, Image, Clip Art or a Movie File. 1. Click the New Slide button (a few times). 2. Click the thumbnail for the second slide shown on the left side of the screen to go to the second slide. Note:To choose a layout for the slide, click the arrow next to New Slide, then click the layout that you want. 3. Type in the title “Introduction,” and then click on the “Click to add text” field to start typing in some bullet points for your slide. 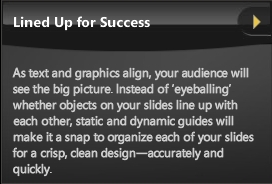 Note: To make a good slide show, make sure your bullet points contain only small tidbits of text, not huge paragraphs. Remember that when you are giving a presentation, it is you, the speaker, who is the most important part, not the PowerPoint slide show. The slide show is nothing more than a visual aid, and as such, it’s helpful to have more than just text. Insert images, flow charts, graphs or anything else that will make it easier for you to get your point across to your audience (don’t flood your slide shows with content, but instead, keep it simple). Finally, you should have no more than one slide per minute of speaking. There’s no need to have a boring white background for your slide show. 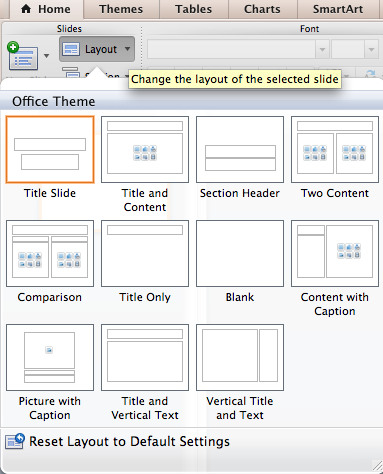 With PowerPoint, you can quickly choose a Slide Theme for your entire slide show. Click on the Themes tab, under Theme Options, click Background and choose a theme that tickles your fancy. It will automatically be applied to your entire slide show. Themes are applied to the entire PowerPoint presentation. It is not possible to use one theme for one slide and then use another theme for another. However, some of PowerPoint 20011’s new themes have 2 different backgrounds, one for section headers and one for the others, so it is possible to distinguish those slides. In the sidebar, click Fill, and then click the Solid, Gradient, Picture or Texture, or Pattern tab to choose the background fills that you want. To remove custom backgrounds and apply the default background for the theme to all slides, click the Solid tab. On the Color pop-up menu, click Automatic, then click Apply All. You can move from slide to slide by simply scrolling up and down using the vertical scroll bar on the right side of the window. There are two methods that can be used to navigate your slides. In normal view, you can click on the thumbnail to go to the slide you want and move slides vertically in the navigation pane. In slide sorter view, you can see more slides at the same time, which is useful when you want to organize large presentations. You can find the Normal View tab at the bottom of vertical bar window and to view your slides in Slide Sorter view you can click on icon. With PowerPoint, you can make a slide show as simple or as elaborate as you like. One simple way to add a little pizzazz to your presentation is to add transitions between your slides. Transitions make moving between slides more visually interesting. You can easily apply the same transition to all slides, including the effects and options you’ve selected for that transition. On the Transitions tab, under Transition to This Slide, click the transition that you want; for example Fade. To see more transitions, point to a transition. You can click . To vary the transition, such as the direction it moves on the screen, click Effect Options, then select the variation you want. Or, you can change other options such as duration, sound, or advancing the slide. While working on your slide show, there are a few different ways you can view it as you’re editing. To change views go to the bottom left hand corner. There are three views Normal View, Slide Sorter View and Slide Show. The Normal View is the view that you see by default when you create the presentation. You see the slide in a WYSIWYG (what you see is what you get) fashion, and you have a sidebar on the left side of the window. The Slide Sorter view shows you thumbnails of all your slides. This view is useful if you want to quickly find a slide, or if you want to do a change to a batch of slides (like add a specific transition or animation). To add a transition to a batch of slides, go to Slide Sorter view, select the slides you want to apply the transition to, click the Transitions tab, and click on a transition. Clicking the Slide Show button will start your slide show. Click on your first slide, click this button and see how your slide show looks now. To move forward a slide, just click the mouse button. If you want to move a slide to a different position in your slide show, drag its thumbnail in the side bar in Normal view or drag its thumbnail in Slide Sorter view. Aligns Text and Photos to be consistent through out the presentation. The new features also allows you to have an actual clock on your presentation to make sure you’re on time with your delivery. In addition, it comes with a timer for how much time you should spend on each slide. To see a brief demo, click here . 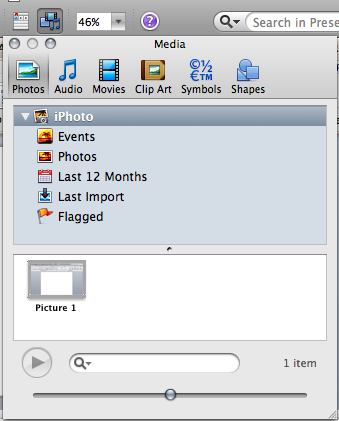 You can access your iPhoto, videos and audio collection within PowerPoint using the Show or hide Media Browser allows you to add pictures, videos and other features. To save, click the File > Save. You can also use the CMD+S keyboard shortcut. PowerPoint 2011 uses the same file format as PowerPoint 2008 which is a different file format than previous versions. Therefore, older versions of PowerPoint will not be able to open a PowerPoint 2008/2011 file without a compatibility add-on. However, PowerPoint 2008/2011 can save presentations in the older format. Click the File > Save As and choose PowerPoint 97-2004 Presentation (.ppt). The add-on from Microsoft is available here. It is listed as Open XML File Format Converter for Mac 1.1.9 and found under Additional Tools. Technology Help Desk maintained by Diane Gossman. Page last updated on 17 July 2018.